Cheese Grits are about as Southern as it gets, and this delicious make-ahead Southern Cheese Grits Casserole is a perfect side dish for everything from an elegant Easter or Mother’s Day Breakfast or Brunch to a quick weekday meal. For a change of pace, this year why not entertain your family and friends with my easy Easter Brunch menu: Southern Cheese Grits Casserole, Sweet Potato Biscuits with Country Ham and Cranberry Aioli, Make-Ahead Frozen Fruit Salad and Lemon and Blackberry Bread Pudding. Need even more ideas, check out my easy 32 Mother’s Day Breakfast and Brunch Recipes! Or, if you are looking for other popular recipes from the South, check out these delicious favorites: Southern Potato Salad, Southern Pecan Praline Cake, Southern Style Crab Cakes, and Easy Classic Southern Tomato Pie. Intrigued? Check out, even more, Southern Recipes. Cheese Grits are the ultimate comfort food in the South and, if you have never had them, well let’s just say you don’t know what you’re missing. They are inexpensive, quick and easy to make, nutritious, gluten-free, and you can serve them for breakfast, lunch, or dinner. They can easily be substituted for their cousin polenta, mashed potatoes, or any starch or grain and are delicious all by themselves or topped with bacon, ham or sausage, barbecue pork, shrimp, beef short ribs, tomatoes, spinach; you get the picture. Grits are even in vogue now with “Grits Bar” stations popping up at wedding receptions and other Southern soirees. I’ve been eating cheese grits my entire life and I have to say it’s hands down my favorite breakfast food! This yummy Southern Cheese Grits Casserole takes all of the yumminess of an easy cheese grits recipe and transports it into an incredible company-worthy, make-ahead, baked cheese grits casserole that feeds a crowd. If you like cheese grits, you also might want to try my scrumptious Easy Cheesy Parmesan Shrimp and Grits entrée, if you have never had cheese grits, this recipe will make a believer out of you! 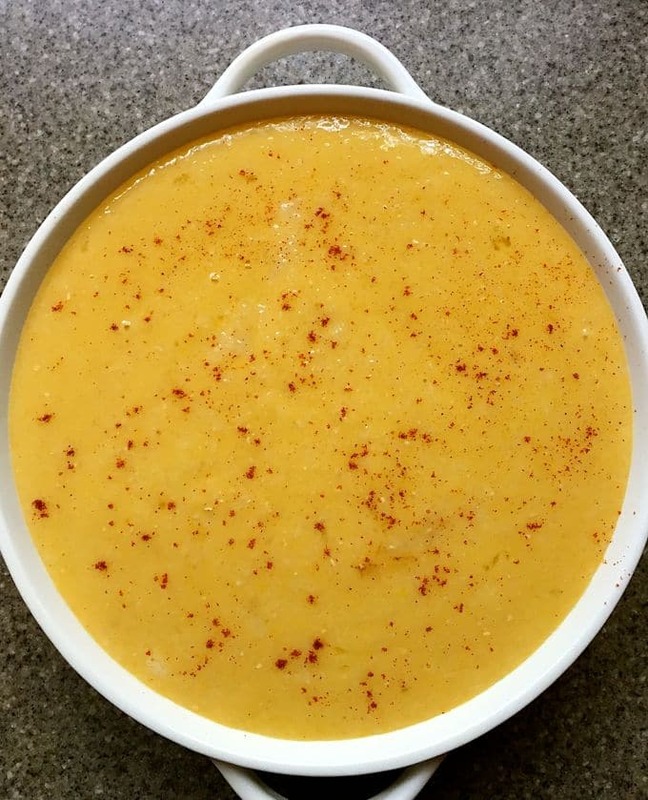 The ingredients for Southern Cheese Grits Casserole includes quick-cooking grits, sharp cheddar cheese (You can use any hard cheese you like or have on hand and, if you are a cheese lover like me, feel free to add up to 2 more cups of cheese. It will just be our little secret! 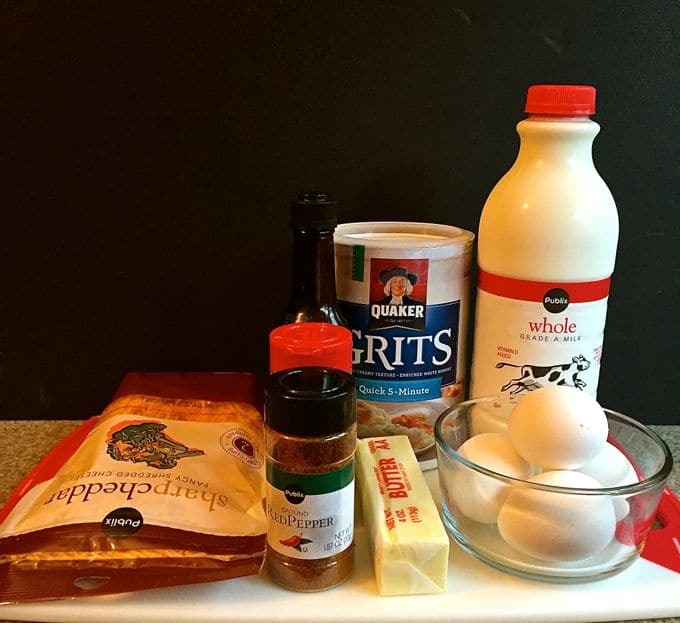 ), milk, butter, Worcestershire sauce, garlic powder, ground red pepper, eggs, Parmesan cheese, and paprika. To make Southern Cheese Grits Casserole, gather your ingredients and preheat the oven to 350 degrees. Add water and salt to a large saucepan over high heat and bring to a boil. Add the grits and mix well, bring back to a boil. Reduce the heat to low and simmer covered for five minutes. Stir occasionally. Remove from the heat and add the cheddar cheese, milk, butter, Worcestershire sauce, ground red pepper, and garlic powder. Mix well to combine. When the butter and cheese have melted, add the eggs and make sure they are thoroughly mixed in with the other ingredients. Spray a 2-quart baking dish with non-stick cooking spray and pour in the mixture. Sprinkle with paprika and the parmesan cheese. Bake uncovered for one hour. Let the casserole stand for 5-10 minutes before serving. If you liked the recipe above, please consider rating it and leaving a comment below. I love hearing from you. 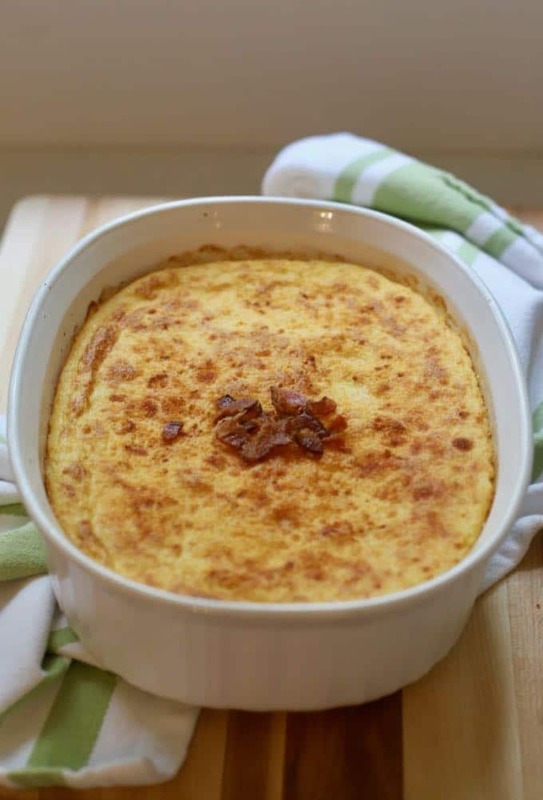 Cheese Grits are about as Southern as it gets, and this delicious Southern Cheese Grits Casserole is a perfect side dish for everything from an Easter or Mother's Day Brunch to a weekday breakfast. Remove from the heat and add the cheddar cheese, milk, butter, Worcestershire sauce, ground red pepper, and garlic powder. Mix well to combine. 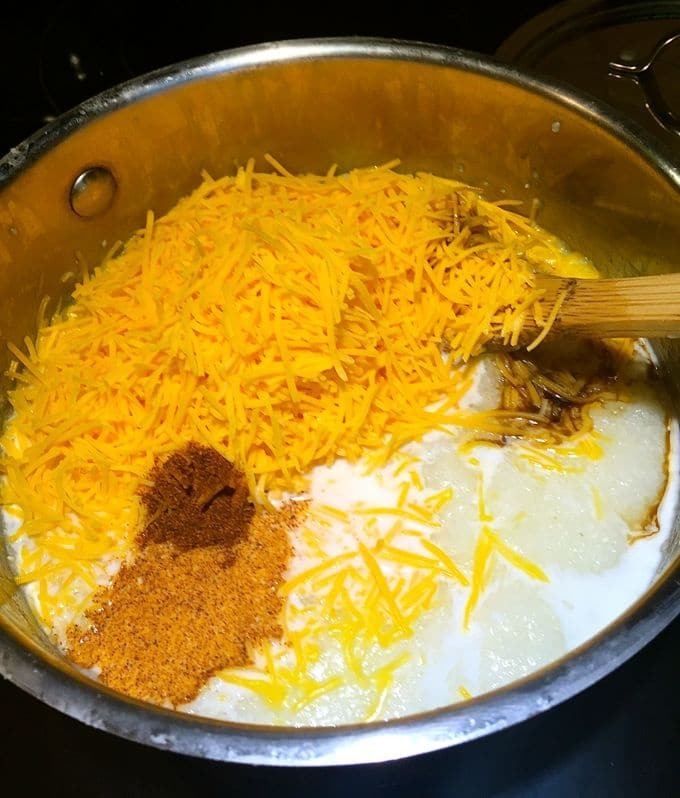 When the butter and cheese have melted, add the eggs and make sure they are thoroughly mixed in with the other ingredients. Spray a 2-quart baking dish with non-stick cooking spray and pour in the mixture. Sprinkle with paprika** and the Parmesan cheese. *If you like cheese, feel free to add up to two more cups of cheese. **It works out better if you just pour a little paprika in your hand and take a pinch to sprinkle over the dish rather than adding it straight from the spice jar. Oh Sharon, this looks delicious! We are breaking food tradition this Easter and shying away from our annual baked ham. We are tossing it in for BBQ ribs! I think your Southern Cheese Grits Casserole would make for a great side dish. Thanks Velva! You are such a rebel! I really would like to know if this casserole can be frozen. I want to make it for families when a loved one passes away. Hi Josette, that is such a sweet thought but I have never frozen a cheese grits casserole so I can’t speak from experience. I did look online and several websites do say that they freeze well. So, if you decide to try it, please come back and leave a comment to let me and my other readers know how it did. I would also recommend letting the casserole thaw out overnight in the refrigerator before baking it. Try freezing one.. See if it works!!! I made this tonight and it was wonderful. Ive always been a fan of this casserole & its so easy to put together. I did substitute 2 cups of the water for chicken broth and added more cheese to the top. So good! Hi Jennifer, thanks so much for letting me know and I’m so glad you enjoyed it. More cheese is always a good thing! Can this recipe be made in a thirteen by nine casserole or should I double it? Thank you! Hi Joann, yes, you can make it in a 9×13 inch casserole dish. Whether you double the recipe or not depends on how many folks you are feeding. This recipe should make about 8 medium size servings. Hope this helps! Yes,it does. Thanks so much! This looks terrific! Is it possible to make ahead? I will have to double recipe so will I need two 9×13 casserole dishes? Family will be coming immediately after church and can’t wait an hour for it to bake. Hi Melinda, I have never baked it ahead, so I can’t say for sure how it would turn out. If you do decide to do it ahead, I think the best way would be to bake it in the morning before you leave for church and then cover it with foil and leave it out. I would not refrigerate it. Then you might just have to reheat it for 15-20 minutes before serving it. Please let me know how it turns out! Hi Melinda, I just noticed you also asked about the size of baking dish to use if you double the recipe. A 9×13 dish usually holds 3-quarts. This recipe calls for a 2-quart dish and it just fits. If you double the recipe you will have 4-quarts so you could use 1 9×13 dish and a smaller one, or 2-9×9 inch dishes. Hope this helps! What’s the purpose of the eggs? I am not a fan of adding eggs to anything but a cake or cupcakes. Could you substituted something for the eggs? You can leave the eggs out if you like. Their only purpose is to set the grits mixture so that it is firm. The grits might be a little looser, but it shouldn’t affect the taste. Oh Sharon – you have really found the next level with cheese grits. I’ve made them for years with my mom’s recipe and I have to say, these are the most flavorful, complex, delicious cheese grits I’ve ever made. Kudos to you – this is just amazing, next level stuff. Thanks. Thank you so much for your sweet comment! I have to say, you made my day! So glad you enjoyed the grits! Can this be mixed up and left in the refrigerator overnight? So any adjustments need to be made? Ie should the eggs be added right before baking? I have never tried making it ahead like that, but I think you would want to go ahead and add the eggs in while the grits are still warm to make it easier to mix everything well. Then cover and refrigerate it. I would also take it out of the fridge about an hour before you plan to bake it to allow it to come to room temperature and then bake as directed. Good luck and let me know how it turns out.